Josh Brener stars as Nelson "Big Head" Bighetti in season four of HBO's "Silicon Valley" (John P. Johnson/HBO). 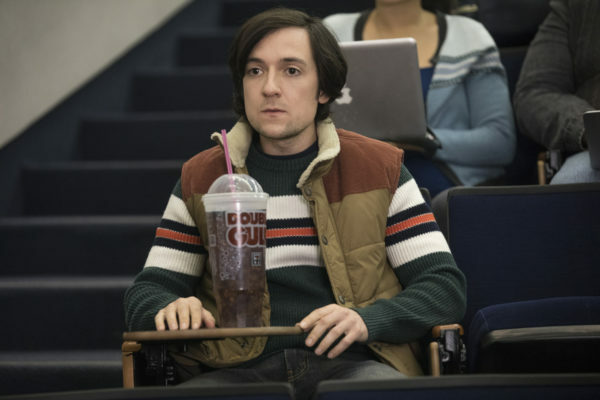 Josh Brener, actor and self-proclaimed nerd, currently stars as Nelson “Big Head” Bighetti on HBO’s hit series “Silicon Valley” and has appeared previously as Dale on “The Big Bang Theory” and in a number of independent films. While an undergraduate at Harvard, Brener was the president of the Hasty Pudding Theatricals as well as a member of On Thin Ice, Harvard’s oldest improv group. The Stanford Daily had the opportunity to talk to Brener about improv on “Silicon Valley”, his college theater experience and cast antics on set. The Stanford Daily (TSD): “Silicon Valley” feels like a show that’s loose, but also tight at the same time, as far as the dialogue goes. How much do you improvise, and how much of that improvisation makes it into the final product? Are you encouraged to do that? Josh Brener (JB): Great question, thanks. That’s a good observation — you said in terms of it being both sort of tight and sort of loose at the same time, yeah? JB: Yeah — that is very astute because we are lucky to have, I think, the most brilliant writers in comedy, so the scripts that we’re working from are unbelievably smart, and unbelievably funny, and absolutely, intricately structured and designed. Having said that, TJ Miller, Thomas Middleditch, Kumail Nanjiani and Zach Woods, especially, are like genius-level comedians and improvisors. I think that when you have that, you sometimes want to take advantage of it. So I know at times, Alec Berg, who is one of our showrunners along with Mike Judge, when they’re writing a scene, will sort of focus on the story and the structure aspects of it, and say, “Don’t worry about the comedy, the boys will figure out the comedy. The girls — the actors will figure out the comedy.” In some respects, we’re given a lot of leeway if we’ve got fun ideas, to try them out and throw them in, and see what develops, especially when you’ve got TJ and Zach and Thomas. When you’ve got them in the sort of right mood, stuff will come up as unbelievably hilarious, and then also a lot of stuff will come up that is too insane or too gross or too offensive, or too weird — mostly weird — to make it into the show. Our editors have their hands full in that respect. I would say though that most of what you’re seeing is what the writers have done, and then the way that stuff is delivered, with jokes added in, with little asides, with a run that might go on a little longer than it did in the script — there’s definitely a lot of that. But I do feel that you have to give most of the credit to the writers because they put together unbelievably funny and well thought-out episodes, as you know. The improv from our group is maybe a little icing on a very delicious cake. TSD: Here at Stanford, straight in the heart of Silicon Valley, I feel that our comedy scene is a little stifled, partially due to the dominance of the tech and startup culture. How did your comedy and performance experience, as a Harvard student and as such a contrast from the tech-centric world we live in today, influence how you view tech culture? JB: I was pretty lucky. I think that sort of thing depends on who your classmates are and what your environment is. I was just lucky that I was in an improv group with a bunch of really funny people, and the Hasty Pudding Theatricals, the theater group, also had a bunch of really funny people. A lot of Harvard’s theater and comedy community is sort of student run — there’s not really an infrastructure, not really a theater major, that kind of thing. It was sort of just dependent on who your fellow classmates were and what they made of the theater spaces on campus. I was just lucky that there happened to be a bunch of super funny, super motivated people around me that I got to glom onto, and improvise with, and write with and do that kind of thing. In terms of comedy writing, I wasn’t a part of the Harvard Lampoon, the humor magazine, but that’s sort of this juggernaut that sends lots of comedy writers out to LA. There’s this huge alumni community of writers from the Lampoon like on “The Simpsons” — Alec Berg, who runs our show, and a couple of the other writers were from that world, so there is this sort of cool comedy-nerd network from Harvard that was great to have. In terms of how that affected me looking at the tech industry — it didn’t [laughs]. Honestly, I am such a tech-phobe. This was all totally new to me and I had to read a lot about it and sort of learn about it because this is way over my head. I was totally such an English major, humanities-type person. This has all been new to me — fun to learn about, but a lot of fun to be had with that world, as I’m sure you know. TSD: A lot of the character interactions are very Silicon Valley-specific in the jargon, but a lot of the interactions and pairings of different characters are still very universal. What do you make of the characters’ interpersonal relationships, such as the interesting “bromance/frenemy” relationship between Dinesh and Gilfoyle among others? JB: Yeah, I think if shows, and especially comedies, are doing their job right, it’s making characters that are real and relatable and that resonate. That’s because we want the characters to be reflections of ourselves. Mike Judge is such a genius at understanding people to their core. He tells a story about somebody and he inhabits the character of the person he’s talking about. He has such an incredible for that, so all of the characters are fully realized human beings. Plus, with Dinesh and Gilfoyle, we’re lucky to have Martin and Kumail playing the characters, and they’re great actors who are very quick with barbs and sarcastic, sardonic remarks, and so that relationship, which was sketched in at the beginning, has grown also much because they’ve inhabited that relationship and enjoy so much hating on while also quietly loving each other. I think our writers do such a good job creating these relationships and then it’s just fun for us as actors to inhabit these full, realized characters that they’ve created for us. TSD: Switching it up a bit, I was wondering if you had any good stories from being on set, any practical jokes or anything like that? JB: There are plenty of antics around set. One of my favorites was — I don’t know if it was season two or season three — but there’s a storyline on the show about the jackets, the Pied Piper jackets, if you’ve seen that, the hideous green and yellow jackets. That’s based on a real thing because TJ decided to make letterman jackets for everyone in the cast that said “Rude Boys on the Lot” on them for some reason and they had like dice on them. They were just absolutely absurd — “Rude Boys on the Lot” meaning like the studio lot where we shoot the show and “Rude Boys” meaning, you know, we were the bad boys. That happened at the same time when someone, maybe Martin, got a bunch of these electric scooters, so the boys would ride around in their letterman jackets, on these electric scooters— which is not allowed on the lot, specifically not allowed on the lot — in their “Rude Boys on the Lot” jackets, and be like chased down by security and yelled at and complained about. The writers found this absurd and enjoyable, and wrote it into the show. So that’s one of my favorites in terms of off-screen antics becoming on-screen antics. Season four of “Silicon Valley” currently airs Sunday evenings at 10 pm PST on HBO. Contact Olivia Popp at opopp ‘at’ stanford.edu.